A £13m upgrade of a section of railway in Derbyshire is set to disrupt services for passengers while work is carried out. Ambergate Junction is being relocated and the track realigned to increase train speeds, Network Rail said. 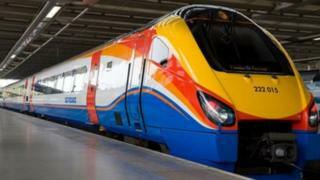 Some East Midlands Trains services, including Derby to Matlock, will be affected until 16 February. There will also be no direct services from Sheffield and Chesterfield to Derby, the train firm said. The Ambergate Junction is a "crucial part of the rail network" and is where the Matlock branch line leaves the Midland Main Line. It is claimed the work will improve the speed at which trains can travel on this section of track. The work follows the Derby re-signalling project which was completed in October. Rob McIntosh, from Network Rail, said: "We appreciate that closing the line between Derby and Matlock for six days will be inconvenient for passengers. "We thank them for their patience whilst we carry out these vital improvements at Ambergate, which will increase the line speed and bring a more robust timetable for passengers in the years to come." Some services to London will also be affected.